Last year I introduced a new concept called App Logic Controller or ALC. You basically run an app store on a PLC type of device and as such any industrial protocol, edge analytics, cloud or other industrial integration is an app away. Developers can make industrial solutions in days if not hours via open source tools, and customers can get them running in minutes. Anybody will be able to sell their industrial solution as an app. Brands can run their own industrial app store. We have shown on MWC how this will revolutionise something as trivial as an elevator that now starts generating new revenues, save lives and can catch intruders. We are seeing how companies like Kunbus are using the Raspberry Pi Compute Module 3 to create ALCs like the Revolution Pi as well as UniPi with their Neutron on top of a Raspberry Pi 3. Industrial solutions at unseen price levels! 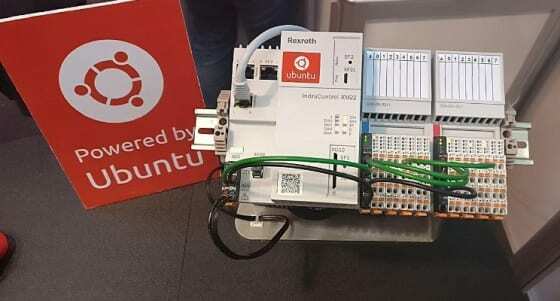 At Embedded World earlier this year in Nuremberg we showed for the first time the Bosch Rexroth ALC at the Ubuntu stand. So if you want all the industrial reliability of a PLC but the easiness and speed of an ALC, this is what you can find. Rexroth is out-innovating the PLC market because ALCs can be integrated into the Cloud as shown with our Salesforce IoT Cloud demo on MWC, voice enabled via Alexa, and controlled by a long list of industrial edge solutions like Cloudplugs, Azeti, Cumulocity and many others in minutes. Distributed Control Systems can be substituted by App Enabled IoT Gateways like Dell’s IoT Edge Gateways 5000 and 3000, Industrial and fast innovation can now be combined.